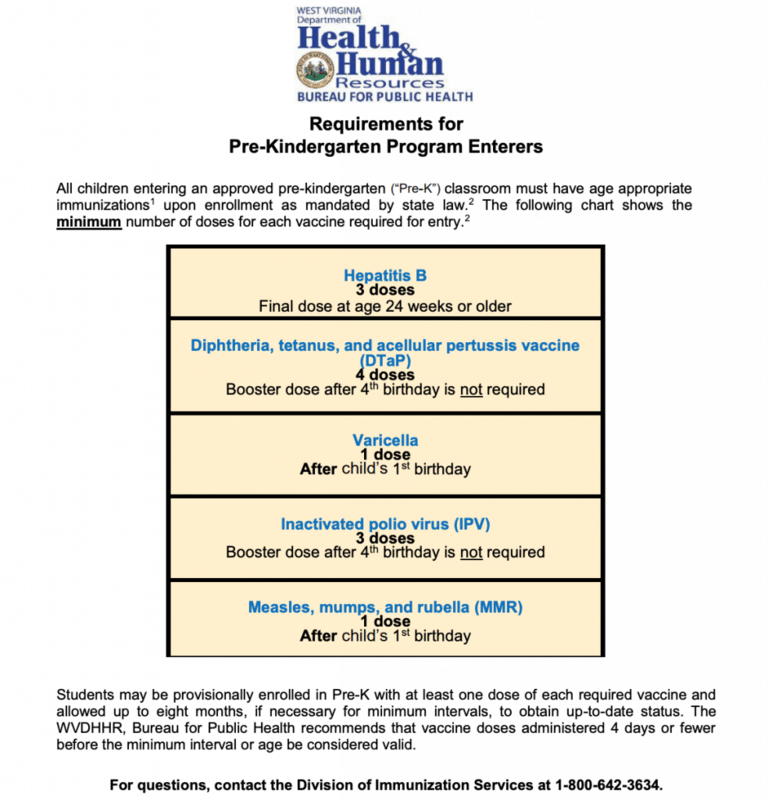 Below are resources for you to use to find out what the West Virginia vaccine requirements are for children in different situations. 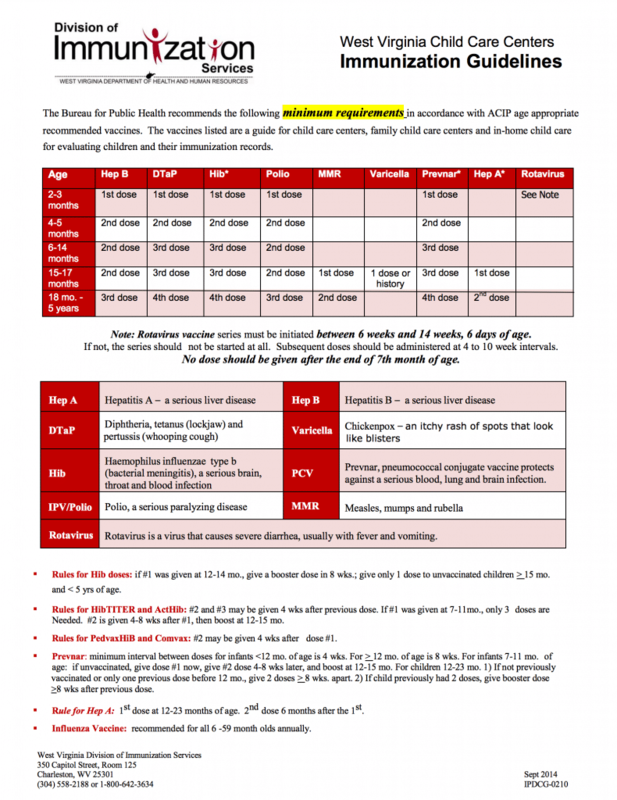 This chart explains the vaccinations required for children entering daycare. These requirements are recommended in conjunction with the recommended schedule from the Advisory Committee on Immunization Practices (ACIP). If your child will not need daycare or be enrolled in a pre-K program, please see the following link for school entry as less vaccinations are required. 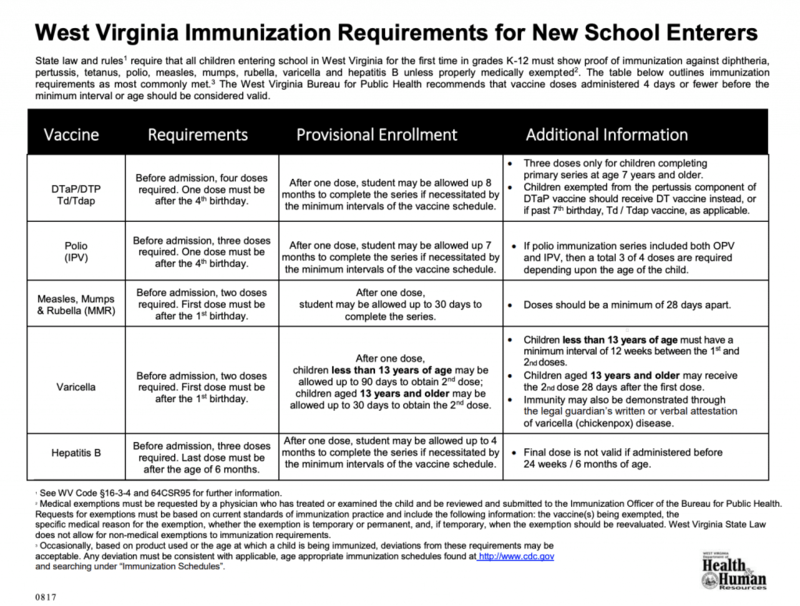 This chart explains the guidelines for assuring the minimum required vaccinations for children entering pre-K. There are rules regarding the dosing of the Hib and PCV vaccination. ***PLEASE NOTE that students may be provisionally enrolled in Pre-Kindergarten with AT LEAST ONE DOSE of each required vaccine and allowed up to EIGHT MONTHS to obtain up-to-date status. If your child will not need a pre-K program, please see the following link for school entry as less vaccinations are required. This chart explains the requirements for children entering school for the first time. 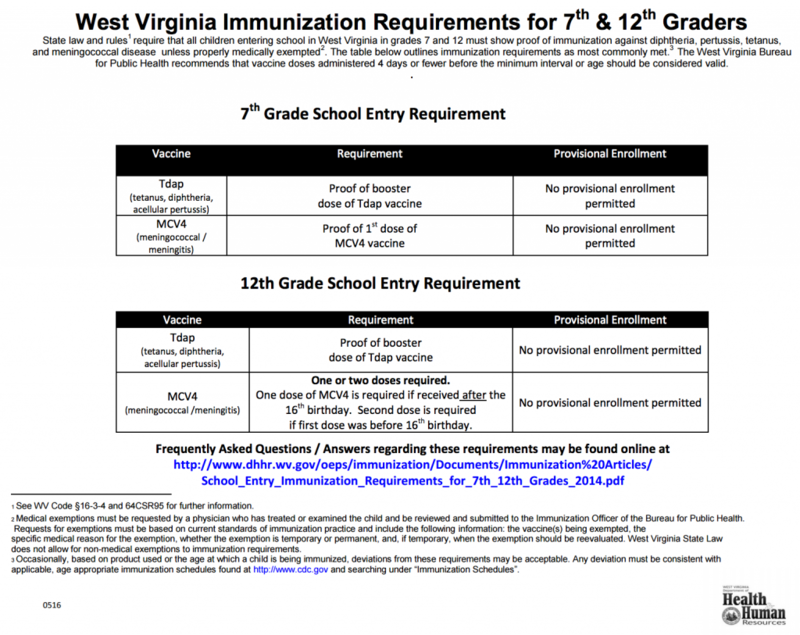 The vaccinations required for school in West Virginia are less than what the CDC and ACIP recommend on the childhood recommended schedule. ***PLEASE NOTE THAT THE ROTAVIRUS, HEP A, PCV, HIB, HPV, AND ANNUAL INFLUENZA VACCINATION ARE NOT REQUIRED FOR SCHOOL ADMISSION. This chart explains the requirements for children entering THE 7TH AND 12TH GRADES. Please see the rules regarding administration of the vaccines. ***PLEASE NOTE THAT THE HPV AND ANNUAL INFLUENZA VACCINATION IS NOT A REQUIREMENT. These are RECOMMENDATIONS and not specific to West Virginia higher education institutions. Please check with your specific school regarding offered exemptions from vaccinations.